Chef on the Farm: What to do with all that cabbage? 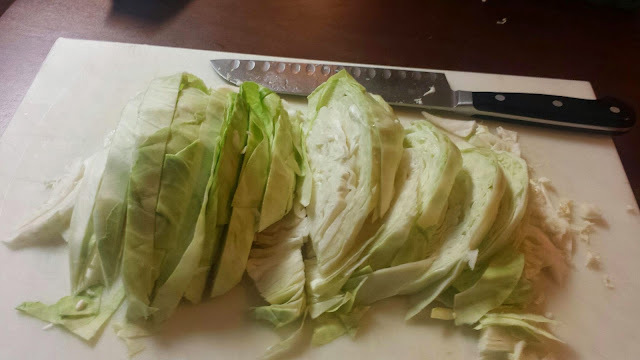 A few weeks ago, I made Braised Coconut Curry Cabbage, and, man-oh-man, was it a hit at my house! Since cabbages are pretty big, more than likely there will be a bit left-over. Don't worry about that as it can be frozen and saved for when cabbage is out of season, or (and my personal favorite) saved for cold lunch the next day. Remember to always think ahead when it comes down to growing and eating seasonally. There aren't many crops that produce year-round. Instead of buying not-in-season produce at the grocery store, embrace that fact and love & savor them while they're here. Note: Always have your mise en place ready. Cut the head in half and remove the core. Place the flat side down and slice into thin ribbons. In a saute pan over med heat, melt 1 tbsp butter. Add half of the cabbage to the pan and let it cook down for about 2 minutes, stirring often. Add 1/2 tbsp butter and the rest of the cabbage. Let this cook down another 5 minutes then add a small pinch of sea salt. Stir in 1 cup coconut milk and turn down the heat to a simmer. Incorporate the curry powder until it's all dissolved. Add the rest of the coconut milk along with the chile pepper. Cook until the cabbage has your desired consistency - shoot for al dente. Season with salt to taste then mount the rest of the butter. This dish can be served as a side, or add some lightly sauteed shrimp and fresh basil to serve as the main course. Don't forget - if you happen to have any left-overs, either freeze for a later date or just eat them the next day. I really enjoyed it cold. Hi John! Came across this recipe and it harkens to something of an Indonesian derivative. Since my Dad is half Indonesian and half Dutch and taught me how to cook his way, meals in our house are interesting, to say the least. I'm going to surprise the wife in a day or two with this and plate it with jasmine rice. I'll let you know how it goes! Follow-Up: The wife loved it! The aroma was amazing and I learned something new, how to "mount" butter to change the characteristic of the sauce. I prepared this the other day and the whole family just loved it. I am planning to prepare this next week also. Thanks for the share. Private Chef In London Really appreciate you sharing this blog post.Thanks Again. Fantastic.